The V&A comprises the museum at South Kensington, the V&A Museum of Childhood at Bethnal Green, and the archives and stores at Blythe House, Kensington Olympia. All V&A museums are free entry. 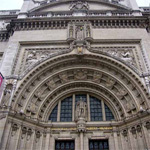 V&A South Kensington is the world's greatest museum of art and design, with collections unrivalled in their scope and diversity. Discover 3000 years' worth of amazing artefacts from many of the world's richest cultures including ceramics, furniture, fashion, glass, jewellery, metalwork, photographs, sculpture, textiles and paintings. The Museum of Childhood in Bethnal Green is home to one of the world's largest and oldest collections of toys and childhood artefacts. The collection, which dates from the 16th century to the present day includes dolls, teddy bears, toy soldiers, train sets, model cars, puppets, rocking horses, costumes, board games, and some of the first jigsaw puzzles ever made. The V&A's Theatre Collections have now moved from the Theatre Museum building in Covent Garden, and new theatre and performance galleries at South Kensington will open in 2009. Meanwhile, you can see new temporary theatre and performance displays at South Kensington and on tour nationally.